The Olympic Games were founded by Heracles (the Roman Hercules), a son of Zeus. The first Olympic Games for which there are written records were held in Olympia, Greece in 776 BC (though it is generally believed that the Games had been going on for many years already). The Games grew and continued to be played every four years (an Olympiad) for nearly 1200 years until The Romans, who conquered Greece, viewed the Olympics as a pagan festival. Dude!!! You knew it was coming! Smaller tech units with increasingly larger storage and of course more bells and whistles. 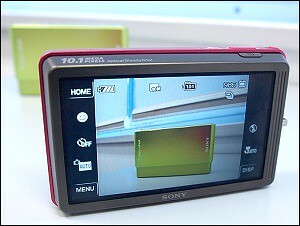 This camera is said to be available in September from Sony and should be a hot holiday item. Shoot to thrill. Carry your entire photo collection wherever you go with the pocket-sized, 10.1-megapixel DSC-T700 Cyber-shot® digital camera. Frame, review and share your photos on the dazzling, 3.5″ touch-screen LCD. Boasting 4GB of internal memory, you can also store up to 950 high-resolution or 40,000 VGA-sized images. HDTV Compatibility ** View your photos in glorious high definition on a Sony® BRAVIA® or similar HDTV using the included HD output adapter cable (VMC-MHC1) or optional Cyber-shot Station® cradle (CSS-HD2). Enjoy highly detailed, Full HD 1920×1080 images with PhotoTV HD-capable Sony® BRAVIA® HDTVs. Sony’s new Picture Motion Browser will allow you to transfer all of the 10mb images from your camera to your PC while transferring all the same re-sized (640×480 VGA) images right back to the camera, allowing storage for about 40,000 pictures in your portable photo album. The T-700 also has a memory card slot for more storage. Woohoo!